Remember the book "The $64 tomato"? Well, I did some calculating to figure out how much a jar of honey was costing me to produce. The bottom line - it's an expensive bottle of honey. I figure a pound of honey costs me $27.63 to produce. A little better than that expensive tomato, but still a pretty costly jar of honey. Now, I'm a second year bee keeper, so I had a lot of set up costs and they won't be recurring. My set up cost $918. Recurring costs are $640. I added in my time at $30 hr. I've spent about 80 hours producing my honey valuing my time at $2310. Another way of figuring my cost since it's a hobby is to omit my time, which of course is all fun, not work. Also, I can omit set up costs. Now it's much better: a pound of honey is $4.57. I'm impressed that local bee keepers can sell their honey at $9 to $11 a pound. I sure they are much more efficient than me. I'm selling my honey for $10 a one pound jar, and for $7 a half pound jar. I've sold nearly 100 lbs, so I've made over $1000. After 2 years, I've covered my set up costs. Going forward, I really should charge based on my recurring expenses and my time. That's $21.07 a pound - I don't think I'd sell anything at $20/lb. I need to forget my hours or get more efficient. I could probably go to $12 a pound. It's very special honey after all! It does taste very good. I'd like to do the best I can to keep my bees alive this winter so I've been reading and asking at my local bee club. As they say, ask two beekeepers the same question and you'll get three answers. On top of that, bees have a mind of their own and you can treat two hives the same way and they'll still be totally different. So, here's what I've done for my hives. 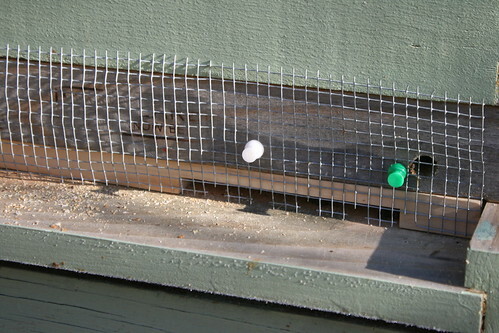 - I modified my mouse guard so the bees can get in and out better. I had used 1/4 inch hardware cloth, but dead bees accumulated inside. Rather than going to 1/2 inch (which small mice can sometimes get through), I pointed the tips down into the baseboard and cut out sections in the 1/4 inch material. There's a photo below. I've read about installing mouse guards and other bee things, but it often makes no sense to me unless I see a picture. 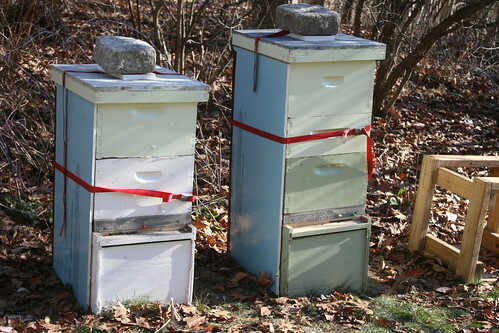 - I strapped 1/2 inch R4 insulation to the north and west sides of the hives. These are the sides with the lowest sun exposure. - I put a stone on top of the hives so any strong wind won't blow the cover off. There is a board under the stone so it doesn't freeze to the top, form ice, and slide off. - I put a basic Home Depot ceiling tile inside the cover for top insulation. The tile is above the inner cover. I left the inner cover escape hole open for venting moisture and to allow access if snow blocks the lower entrance. - I'll check honey stores during the winter by feeling how heavy the boxes are. If they get light, I have honey frames waiting for them. I'll lay them inside the hive at the top for them to empty into their stores. - Finally, I am thinking positive thoughts and hoping my bees are happy and and well this winter.